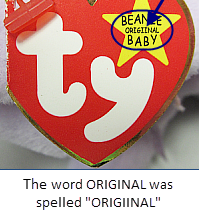 At the beginning of 1998 when the 5th generation swing tags were being introduced, the swing tag on several of the Beanie Babies had two spelling errors on them. 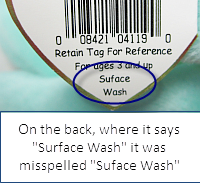 On the front of the tag, inside the yellow heart, the word ORIGINAL was spelled “ORIGIINAL”, and on the back, where it says “Surface Wash” it was misspelled “Suface Wash”. 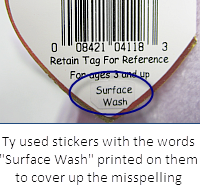 When the mistake was discovered, Ty used stickers with the words “Surface Wash” printed on them to cover up the misspelling. 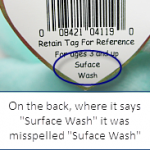 At present, there is no difference in value between the correct versus incorrect tags, and the ones with or without stickers. 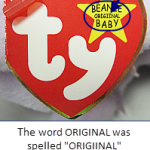 Yes, stories are out there stating they are worth thousands of dollars and this is false information. 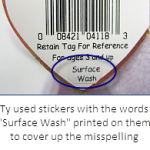 A seller can ask whatever they want for an item. What they actually sell for is what matters.